An expedition that will help NASA search for life in deep space launched today - not with a rocket's roar, but with a gentle splash into the deep Pacific Ocean. The project, called the Systematic Underwater Biogeochemical Science and Exploration Analog, or SUBSEA, will use underwater robots to explore the biology, geology and chemistry of the environment around a deep-sea volcano off the coast of Hawaii. Scientists believe this is similar to what may exist on Saturn's moon Enceladus. Studying the extreme conditions where life can survive on Earth will help them understand the potential for life to exist on other ocean worlds in the solar system. For SUBSEA, NASA is teaming up with ocean research partners from the National Oceanic and Atmospheric Administration, the Ocean Exploration Trust and more. 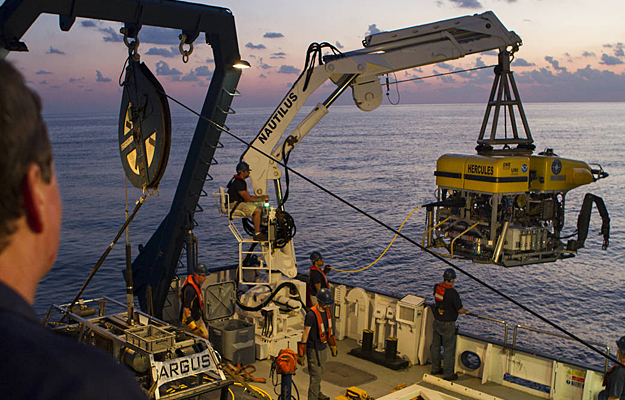 The two robotic explorers, remotely operated vehicles Hercules and Argus, pictured here, are operated by OET and were launched from aboard their exploration vessel, Nautilus. The SUBSEA team will spend three weeks at sea, both studying the volcano and simulating human-robotic exploration for future deep-space missions. Learn more about the SUBSEA project and follow the 2018 expedition on the livestream http://www.nautiluslive.org/ as the team dives deep into the search for life.